We’re giving you good reason to visit Mandwa. Beach Box is a vibrant new open-air area by Mandwa beach, with restaurants, shops, and other fun events like gigs, movie screenings and more. The folks that opened up the beautiful seaside restaurant at Mandwa Jetty are back at it again with a new concept called Beach Box. 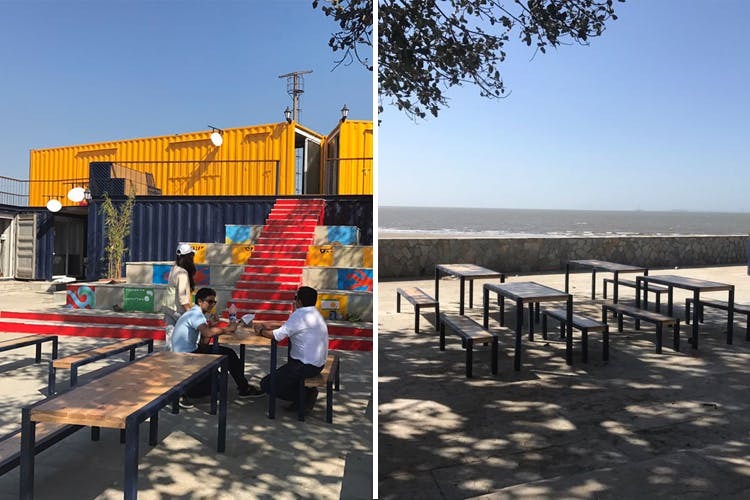 Taking old recycled shipping containers, Beach Box is a rather exciting new open-air area in Mandwa right in front of the beach. There’s plenty to eat, drink, shop and do here in general. As of now, they’ve got Quick Fun Murrugun, Fat Box and Italian Crust to eat at, and will soon have one container solely giving out cold beer by the tap. Shop at a lovely boutique interior store called Bayside Curio Store, and Parx by Raymond. Apart from this, Beach Box is going to be host to a bunch of entertaining events – gigs, flea markets, movie screenings under the stars and a lot more. We’re pretty psyched. Are you? Hop on to a jetty, take your crew to Beach box and spend a colourful afternoon, biting a pizza and sitting by the beach. Follow them on Facebook here to be in the know of the events.